There is some debate over the origin of the meringue. 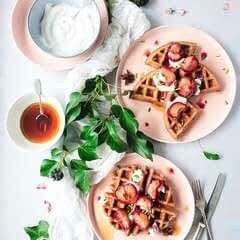 While the French, Swiss and the Polish all claim credit for being the first to whisk together egg whites and sugar, the earliest documented recipe appeared in England in1604. What we do know is that royalty across Europe have delighted in this sugary delicacy for centuries. 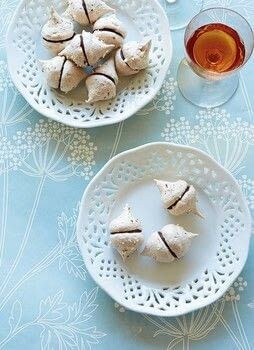 King George II and his courtiers were enjoying chocolate-flavoured meringues during the eighteenth century, while Queen Marie Antoinette is said to have made her own at her Trianon estate at Versailles. These elegant miniature m eringue sandwiches would surely have satisfied monarchs on both sides of the Channel. Preheat the oven to 110°C/fan 90°C/gas 'h. Line a flat baking sheet with baking parchment. Pulse the chopped almonds in a blender until finely chopped, taking care not to overwhizz otherwise the nuts will end up oily. a tablespoon at a time, and whisk in until dissolved. Sift the cocoa powder over the top then add most of the chopped almonds, leaving about a teaspoon to sprinkle over at the end. Fold everything together then spoon into a piping bag fitted with a lcm nozzle. Pipe rounds on to the parchment,sprinkle with the remaining nuts then bake in the oven for around 1 hour. They're ready when the meringues come away easily from the parchment. Leave in the oven to cool.